GOVERNMENT has a salary increment offer for civil servants to cushion them from the prevailing economic challenges set to be tabled before a National Joint Negotiating Council (NJNC) soon, acting Public Service, Labour and Social Welfare Minister July Moyo, has said. The NJNC is a statutory negotiating platform for the Government and civil servants' representatives. It fixes negotiated agreements on salaries and conditions of service for civil servants. Speaking after a consultative meeting between a high-powered Government team and public service staff associations in Harare yesterday, Minister Moyo said the employer was fully aware of the erosion of buying power caused to its workers by rising inflation due to unjustified price increases for basic commodities and the unofficial three-tier pricing system. "The conclusion of this discussion is that they (workers) should now, whether immediately or tomorrow, go into negotiations where Government will make an offer in terms of ameliorating the plight of the civil service in the areas that they have demanded, that is in transport, salaries and other non-monetary issues such as housing," said Minister Moyo. He did not reveal the figures. "Now that we have discussed broadly, they should go back to the NJNC because it is the statutory body that can come up with signed agreements for us to go forward. Government certainly has an offer and they will discuss and agree on timing and certain parameters," the minister said. "The trade unions can offer many alternatives, for instance, is the increase to apply to everybody across the board or do we favour those who are impacted on, that is, those whose salaries are lower? 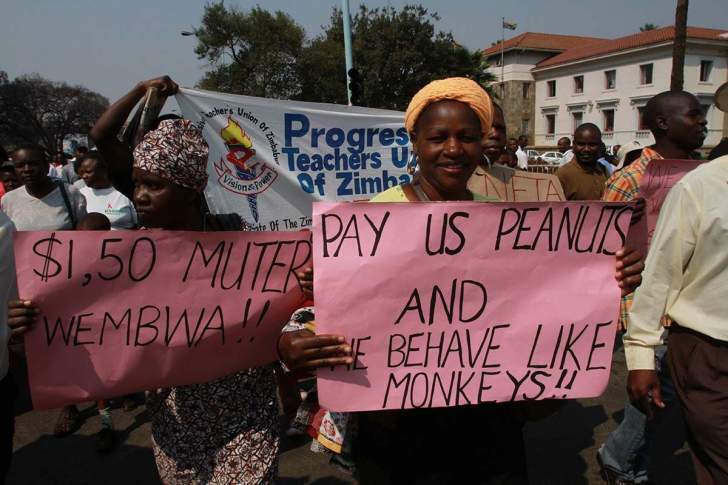 That we leave to them to make proposals," said Minister Moyo. Reserve Bank of Zimbabwe Governor Dr John Mangudya, Higher and Tertiary Education, Science and Technology Development Minister Professor Amon Murwira, Public Service, Labour and Social Welfare Deputy Minister Lovemore Matuke, Civil Service Commission chairman Dr Vincent Hungwe and several permanent secretaries attended the meeting. Minister Moyo said Government acknowledged that civil servants' salaries had been eroded because of arbitrary price increases by manufacturers and retailers. "We have heard the plight of our civil servants, especially of prices which are going up. Governor of the Reserve Bank of Zimbabwe and secretary for Finance George Guvamatanga have been able to explain the nature of the economy and arbitrage that is taking place where prices are going up, sometimes without explanation," he said. "That is why when Government interrogates certain sectors of the economy, again irrationally, you see them reducing prices and the fundamental question becomes why are the prices going up in this economy in the manner they are going? It is impacting on civil servants and the generality of the people," he said. The Minister said the discussions went on amicably. Apex Council acting chairperson Mr Thomas Muzondo said they were ready for the NJNC meeting. "Government has submitted to us that they are opening channels for an NJNC meeting.They are ready. I think they have something for us and we are also ready to meet them to see what they are offering in response to our position paper. For now we are not on strike," he said. He said their salaries had remained static while prices were rising.